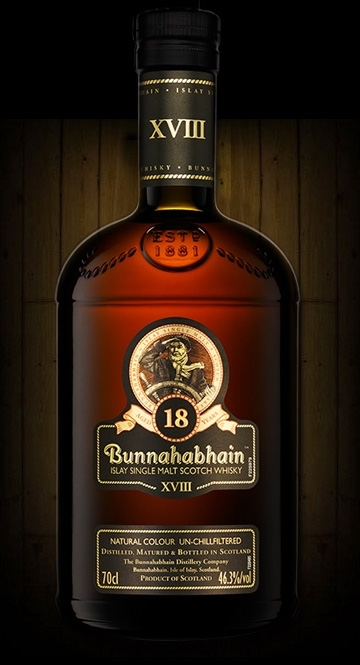 The Wine and Cheese Place: Bunnahabhain 18 ande 25 Year old are back! 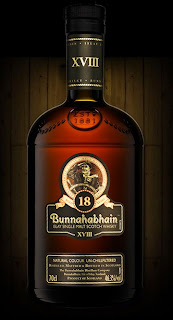 A batch of 18 Year Old arrived today at an amazing price! Our 25 year old has also been re-introduced as an un-chillfiltered spirit, with natural colour, a higher strength of 46.3% and is delivered in a smoked oak glass bottle. Its labelling is on aged parchment and it finds its bed in an Alder wooden box lined with Hessian and closed with solid brass fittings. 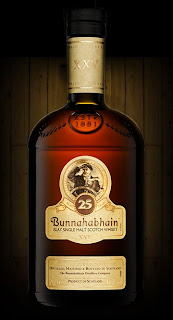 This 25 year old has an amber gold colouring with quite a sherried nose, at first, that introduces a stunning sweet caramel dessert aroma, beautifully entwined with subtle suggestions of oak and polished leather. The indulgence of sweet berries and cream ensures a wonderful mélange of tastes that progress into a roasted nut and malt feast. The finish is soft and dry with a delicate dispersal of sugar and spiced oak flavours lingering on the tongue.